Volunteers are the heart of Family House, for we could not do the work we do here without their help. Our volunteers come from all walks of life, and all ages too. Our youngest volunteer is Peyton James. She’s five years old and has been volunteering here for the past three years, coming once a week when her hectic social schedule permits to help fold laundry with her grandmother, Janice James. Her grandfather is Bob James, one of our board members. There is a familiar routine to Peyton’s volunteer hour here. First, she feeds the fish and identifies any new creatures in our large aquarium. Then she informs us of anything unusual in the tank. When she’s done with this, she walks over to the solarium and joins the rest of the Tuesday laundry folding group. 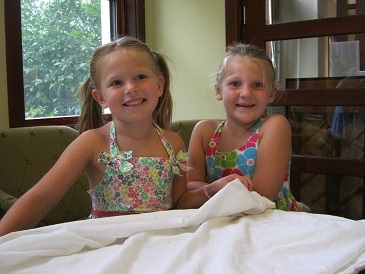 She folds several pillow cases for us before heading off to her next activity with her grandmother. This fall, Peyton is starting kindergarten here in Chapel Hill. Although we won’t be seeing her as often as we’d like, we have a feeling that she’ll be back to fold laundry from time to time, social schedule permitting.